Leaders at the Council on American-Islamic Relations (CAIR) condemn Friday's coordinated terrorist attacks in Paris that left an estimated 130 people dead. They really, really condemn it. But if the discussion turns to the terrorists' religious motivations, they'll condemn that, too. Beginning with social media posts and a news conference with leaders of other Muslim organizations Saturday, CAIR is waging a campaign to stifle any reference to the Islamist ideology that drove the Islamic State attack on Paris. If defeating ISIS requires a war of ideas among Muslims to determine how literally to apply the Quran, CAIR wants no part. "Let's not legitimize ISIS and help them in their propaganda by calling them the Islamic State," CAIR Executive Director Nihad Awad told reporters." They're not Islamic. They're not state. They're anti-Islamic. Let's not call them jihadis. They have nothing to do with jihad. Jihad is a legitimate self-defense in Islam. Let's not give them this legitimizing title. They are brutal killers. They have no legitimacy. "And I urge media, politicians, analysts to be very careful with the choice of their words. ISIS is appealing to the marginalized, disenfranchised and alienated young people in the Middle East and in the West. Let's not help ISIS recruit more disenfranchised and alienated young people." It's an argument directly contradicted by ISIS itself and one being mocked both by Islamic radicals and by secular advocates of religious freedom. In a statement claiming credit for Friday's slaughter re-posted at the Long War Journal, ISIS described the attacks as "a blessed battle whose causes of success were enabled by Allah" to strike "the capital of prostitution and vice, the lead carrier of the cross in Europe — Paris." "This group of believers were youth who divorced the worldly life and advanced towards their enemy hoping to be killed for Allah's sake, doing so in support of His religion," the ISIS statement said. "...The targets included the Bataclan theatre for exhibitions, where hundreds of pagans gathered for a concert of prostitution and vice." 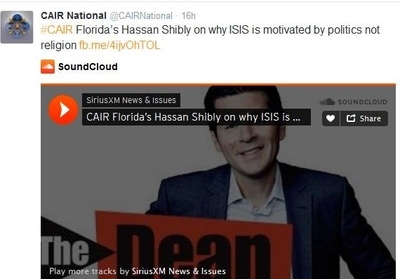 CAIR, meanwhile, created a Twitter hashtag, "TerrorismHasNoReligion," and sent the director of its Florida chapters, Hassan Shibly, onto the radio, where he essentially blamed the victims. It isn't religion that drove the attacks, he said. Rather, it is the consequence of "failing foreign policy" by Western nations including France and the United States. In a four-minute segment, Shibly made seven references to foreign policy, describing it as "bad" and "horrific." Fix the foreign policy, he said, and the terrorism will end. The problem is, "We cannot have a real conversation about terrorism these days." Terrorists, he told host Dean Obeidallah, "are not motivated by religion. They're motivated by politics, by fighting for power and their own political agenda and they use religion to galvanize support. But ultimately, it isn't about the religion. An absence of religion but still with the same political issues, you would still have the same problems. So it's about politics, not religion." This is an argument wholly divorced from any facts about the Paris attacks or about ISIS's ideology. We have cited numerous examples in which Islamist terrorists clearly describe their actions as religiously-inspired. And now, ISIS and its supporters provide fresh examples contradicting CAIR's very premise. In a sickly sarcastic essay, "Sorry Paris," Salafi-jihadist ideologue Hussain bin Mahmud ridicules "our respectable and venerable 'scholars' who opened their mouth faster than the speed of light to condemn those criminal events." Sorry Paris, we have forgotten your enmity towards our religion, your insults towards our Lord and His messenger peace be upon him, your efforts to change our cultures in our countries, and suppressing Islam from the hearts of the young people in the East and the West.. Sorry Paris. "We did this because our holy texts exhort us to do it." Read the entire script here. In its statement claiming credit for the Paris attacks, ISIS refers to its grievances with the "crusader" nations, but makes a point of emphasizing religion. Those countries "will continue to be at the top of the target list for the Islamic State and that the scent of death will not leave their nostrils as long as they partake in the crusader campaign, as long as they dare to curse our Prophet (blessings and peace be upon him), and as long as they boast about their war against Islam in France and their strikes against Muslims in the lands of the Caliphate with their jets, which were of no avail to them in the filthy streets and alleys of Paris." It starts with a Surah in which Allah "cast terror into their hearts so they destroyed their houses by their own hands and the hands of the believers." Never mind that, CAIR says. It insists religion should not be part of the conversation. But despite the protestations, acknowledging the words and ideals that fuel terrorists in no way indicts the belief of the world's billion Muslims or the ideals of any broad spectrum of American Muslims. That is a false argument intended to shut down the debate before it starts. During his interview, Shibly and Obeidallah mocked the argument that terrorists hate us for our culture, for our freedom. As the ISIS statement shows, it views Paris as "the capital of prostitution and vice, the lead carrier of the cross in Europe." According to Shibly, that really means they hate French and American foreign policy. "There's hundreds of other countries in the world that have the freedoms we have but that don't have the problems we have," he said. "We do need to start asking ourselves how is our failed foreign policy leading to the troubles that we are seeing today while recognizing that the actions of terrorists is never justifiable." In a speech last July, British Prime Minister David Cameron rejected the notion that discussions about Islamic theology fueling terrorism be avoided. It doesn't work, Cameron said, in part "because these extremists are self-identifying as Muslims. The fact is from Woolwich to Tunisia, from Ottawa to Bali, these murderers all spout the same twisted narrative, one that claims to be based on a particular faith." Minimizing debate is counter-productive, he added, because there are voices advocating reform who challenge "the fusing of religion and politics, the voices that want to challenge the scriptural basis which extremists claim to be acting on...the voices that are crucial in providing an alternative worldview that could stop a teenager's slide along the spectrum of extremism." These voices lack the profile and money the terrorists have at their disposal. Perhaps Shibly and his colleagues at CAIR are targeting the wrong audience. Rather than tell non-Muslims to ignore the statements issued by Islamist terrorists, CAIR might provide a better public service by loudly and clearly speaking to the terrorists themselves. If the terrorists are wrong theologically, who better than the most visible Muslim advocacy group in the country to set them straight? Instead, CAIR has chosen the same template over and over again. 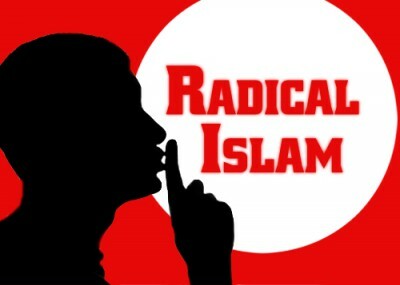 Like "Fight Club," the first rule of radical Islam is you do not talk about radical Islam. "Perhaps Shibly and his colleagues at CAIR are targeting the wrong audience. Rather than tell non-Muslims to ignore the statements issued by Islamist terrorists, CAIR might provide a better public service by loudly and clearly speaking to the terrorists themselves. If the terrorists are wrong theologically, who better than the most visible Muslim advocacy group in the country to set them straight?" Finally, it has been said!! We need everyone's help to get each and every senator to co-sponsor Sen. Cruz's new bill (S. 2230) that will force hearings/discussions on the Muslim Brotherhood in America and the plan they wrote to destroy us from within by what they call their "Civilization-Jihad Process" plan. Next, each of us must ask our House member to cosponsor Rep. Diaz-Balart's bill (H.R.3892) "Muslim Brotherhood Terrorist Designation Act of 2015" Both the House and Senate bills are the same, just different numbers. We need to ask the politicians to co-sponsor the bills and if not why not! Contact your two senators and ask them to cosponsor Sen. Cruz's bill "Muslim Brotherhood Terrorist Designation Act of 2015", S. 2330. On November 3rd Sen. Cruz (R-Texas) filed (S. 2230) and Rep. Diaz-Balart (R-Florida) filed (H.R.3892) both bills titled "Muslim Brotherhood Terrorist Designation Act of 2015". These bills will require the Secretary of State to submit a report to Congress on the designation of the Muslim Brotherhood as a foreign terrorist organization, and for other purposes. Multiple countries have declared the Society of the Muslim Brothers (commonly known as the "Muslim Brotherhood") a terrorist organization or proscribed the group from operating in their countries. Here is Cruz's bill, S. 2230 titled "Muslim Brotherhood Terrorist Designation Act of 2015"
In addition to getting co-sponsors for Sen. Cruz's bill we need to encourage our House members to co-sponsor the House version of Cruz's bill filed by Rep. Diaz-Balart (R-Florida), H.R.3892. Sample request: Will you please co-sponsor Rep. Diaz-Balart (R-Florida), H.R.3892. titled "Muslim Brotherhood Terrorist Designation Act of 2015" and if not, why not? Sample request: Will you please co-sponsor Sen. Cruz's bill (S. 2230) titled "Muslim Brotherhood Terrorist Designation Act of 2015" and if not, why not? Who said this, to whom, when, why and what have we ever done about it? Would you consider this statement to be contrary to our Constitution, our way of life, a danger to our National/Homeland Security and the preservation of our nation and our Constitution? Would you think these are words of an enemy? Surely, both the House and Senate studied this but where are the reports? "The Ambassador answered us that it was founded on the Laws of their prophet, that it was written in their Koran, that all nations who should not have acknowledged their authority were sinners, that it was their right and duty to make war upon them wherever they could be found, and to make slaves of all they could take as Prisoners, and that every musselman [muslim] who should be slain in battle was sure to go to Paradise." Why are we failing to mention the obvious issues in the 1786 letter that still exists today? Here are the main points in 1786; are they the same today with the Muslim Brotherhood in America and their plan they wrote to destroy us? f. "that every musselman [muslim] who should be slain in battle was sure to go to Paradise." j. for each sailor to take a dagger in each hand, and another in his mouth, and leap on board, which so terrified their Enemies that very few ever stood against them." k. "That he verily believed the Devil assisted his Countrymen, for they were almost always successful. The bottom line is this, Islamists that believe in Shariah/Islamic law want to form a GLOBAL Caliphate and we are funding our own destruction with our tax dollars and using our military to fight and die installing it. Look at all the wars we have had for decades now and see who we are fighting!